More than 130 years after its completion, the Brooklyn Bridge remains one of the most extraordinary landmarks and symbols of Brooklyn and New York City—and the story behind this architectural marvel is just as extraordinary. The Brooklyn Bridge was originally designed by John Augustus Roebling, but it was his son, Washington, and his daughter-in-law, Emily, who oversaw the bridge's construction. As work on the bridge went on, Washington developed caisson disease, leaving him bedridden for the majority of the bridge's 14-year construction. Washington's wife, Emily Roebling, took his place running the work site, deftly assuming the role of chief engineer, supervising the project and overseeing the workers, contractors, a hostile press, and greedy city politicians—an unusual position for a woman to take on at the time. 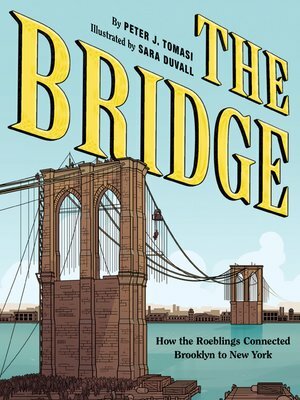 In this inspiring graphic novel, author Peter J. Tomasi and illustrator Sara Duvall show the building of the Brooklyn Bridge as it has never been seen before, and the marriage of the Roeblings—based on intellectual equality and mutual support—that made the construction of this iconic structure possible.